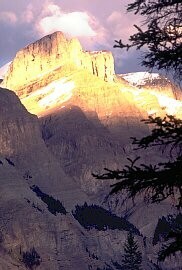 This region, where the rolling prairie meets the mountains, is a one of a kind Canadian National Parks system. This partnership generates a great variety of flowers, plants and animals, that all intertwine with the lakes, streams, waterfalls and glacial formations. The Park, has some of the oldest exposed bedrock in the Canadian Rockies and the more than 200 archaeological sites prove aboriginal peoples history dates back some 11,000 years. In 1895, 525 square kilometers (203 square miles) were set aside to form Waterton Lakes National Park, protecting the land formations, the wildlife, history and archeology in this region. In 1932, Waterton Lakes National Park in Canada and Glacier National Park, in the US, became the world's first International Peace Park. 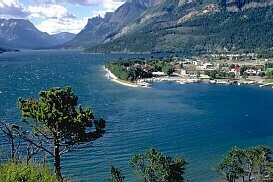 UNESCO, in 1955 designated the Waterton/Glacier Peace Park as a World Heritage Site. In order to understand how people and the environment go hand in hand and the development of this relationship, both Parks have been designated Biosphere Reserves. 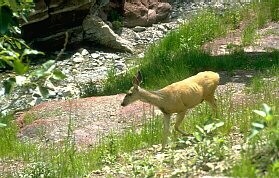 Visit Waterton and get close to nature, go hiking, horseback riding, scuba diving or boating and fishing. Waterton Lakes National Park, is located in the southwest corner of Alberta, bordering British Columbia and Alberta in Canada and Montana in The US. From Cranbrook in B.C. take Hwy. # 3, from Calgary, Alberta take Hwys #2 and # 3 and from Pincher Creek, head south on Hwy.# 6. 1. Belly River Campground has 24 sites that are semi-serviced with washrooms, sewage disposal and camp kitchen. No showers and no reservations. 2. Belly River Group Camp, with only 2 sites is semi-serviced. Reservations are needed. 3. Crandell Mountains has 129 semi-serviced sites. No reservations. 4. Pass Creek Winter Camp has 8 semi-serviced sites. 5. Waterton Townsite has 238 fully-serviced and semi-serviced sites. No reservations. 6. Great Canadian Family Resort, privately-owned offers serviced RV sites and tent sites. The Park has 255 km (191 miles) of trails, ranging from short walks to steep treks that will take several days to hike. There are trails for hikers, horse riders and cyclists. In winter cross-country skiing and snowshoeing are popular activities in the park.